Dominic Martinez is a senior at Marcos de Niza High School. He is taking Advance Placement classes and also participating in a dual enrollment program that will allow him to graduate high school and receive an associate’s degree at the same time. Dominic’s family has always placed a high value on education, especially with his mother being the first and only family member of her generation to receive an associate’s degree. Dominic has exemplified his parent’s diligent attitude and strong work ethic. Despite the financial difficulties that his family has faced, Dominic has been able to overcome the challenges and excel academically in order to achieve his goals. 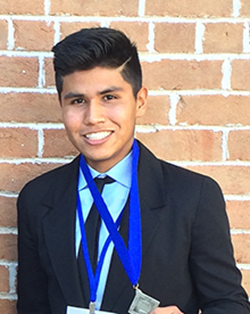 Since attending CHCI’s R2L NextGen program, Dominic has become a role model to his peers and continues to inspire them every day. He is currently the president of the Business Academy program at his high school and recently came in first place for the Fashion Merchandising Promotional Marketing plan in the state of Arizona. Dominic is also captain of his varsity cross country/track and field team. He holds strong ties to his faith and is the current president of his high school’s Christian club. He is a member and founder of his hometown’s Teen Court, which gives him the opportunity to serve as a juror for teen court cases. After graduating college, Dominic desires to continue to give back the community by opening his own business. He also has aspirations to be involved in politics at any level necessary in order to be the voice of for his community. In the future, he visualizes himself being referred to as Dr. Martinez after completing his doctoral degree in business. The CHCI familia is proud of Dominic and his commitment to academic excellence. CHCI congratulates Dominic on all he has accomplished so far and looks forward to seeing the impact that Dominic will have on his community!